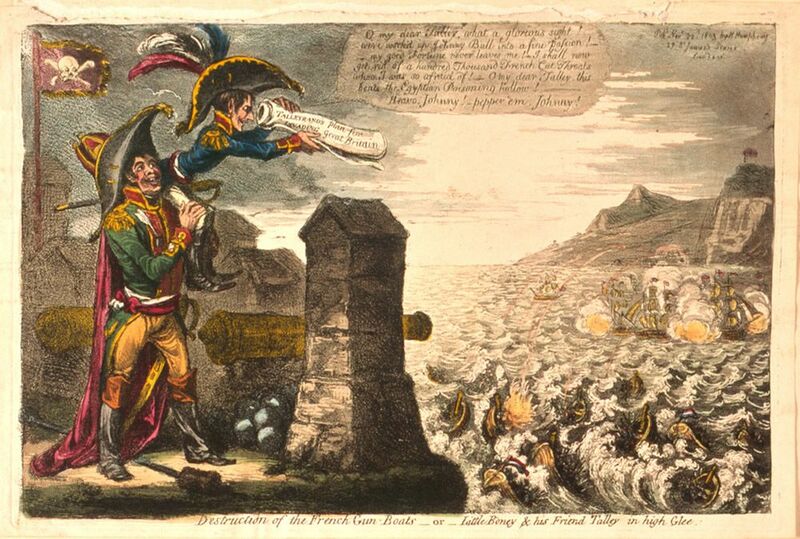 Cartoon, dated 22nd November 1803, depicting the destruction of French gunboats. The French foreign minister Charles Maurice de Talleyrand Perigord stands left of the picture with Napoleon Bonaparte on his shoulder looking through a telescope made from a plan to invade Britain. Napoleon says "O my dear Talley, what a glorious sight! We've worked up Johnny Bull into a fine passion..."
This Destruction of the French Gun Boats or Little Boney and his Friend Tally in high Glee Art Print is created using state of the art, industry leading Digital printers. The result - a stunning reproduction at an affordable price.